"Muse" redirects here. For the English rock band, see Muse (band). For other uses, see Muse (disambiguation). In ancient Greek religion and mythology, the Muses (Ancient Greek: Μοῦσαι, Moũsai) are the inspirational goddesses of literature, science, and the arts. They are considered the source of the knowledge embodied in the poetry, lyric songs, and myths that were related orally for centuries in these ancient cultures. The word "Muses" (Ancient Greek: Μοῦσαι, Moũsai) perhaps came from the o-grade of the Proto-Indo-European root *men- ("to think") or from root *men- ("to tower, mountain") since all the most important cult-centres of the Muses were on mountains or hills. R. S. P. Beekes rejects both etymologies and suggests a Pre-Greek origin. 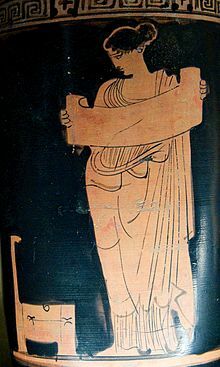 The earliest known records of the Nine Muses are from Boeotia, the homeland of Hesiod. Some ancient authorities thought that the Nine Muses were of Thracian origin. There, a tradition persisted that the Muses had once been three in number. Writers similarly disagree also concerning the number of the Muses; for some say that there are three, and others that there are nine, but the number nine has prevailed since it rests upon the authority of the most distinguished men, such as Homer and Hesiod and others like them. Diodorus states (Book I.18) that Osiris first recruited the nine Muses, along with the satyrs, while passing through Ethiopia, before embarking on a tour of all Asia and Europe, teaching the arts of cultivation wherever he went. According to Hesiod's account (c. 600 BC), generally followed by the writers of antiquity, the Nine Muses were the nine daughters of Zeus and Mnemosyne (i.e., "Memory" personified), figuring as personifications of knowledge and the arts, especially literature, dance and music. The Roman scholar Varro (116–27 BC) relates that there are only three Muses: one born from the movement of water, another who makes sound by striking the air, and a third who is embodied only in the human voice. They were called Melete or "Practice", Mneme or "Memory" and Aoide or "Song". Three ancient Muses were also reported in Plutarch's (46–120 AD) Quaestiones Convivales (9.I4.2–4). However, the classical understanding of the Muses tripled their triad and established a set of nine goddesses, who embody the arts and inspire creation with their graces through remembered and improvised song and mime, writing, traditional music, and dance. It was not until Hellenistic times that the following systematic set of functions was assigned to them, and even then there was some variation in both their names and their attributes: Calliope (epic poetry), Clio (history), Euterpe (flutes and lyric poetry), Thalia (comedy and pastoral poetry), Melpomene (tragedy), Terpsichore (dance), Erato (love poetry), Polyhymnia (sacred poetry), and Urania (astronomy). According to Pausanias in the later second century AD, there were originally three Muses, worshipped on Mount Helicon in Boeotia: Aoide ("song" or "tune"), Melete ("practice" or "occasion"), and Mneme ("memory"). Together, these three form the complete picture of the preconditions of poetic art in cult practice. 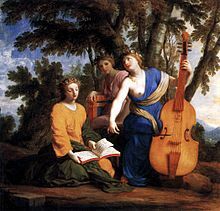 In Delphi three Muses were worshiped as well, but with other names: Nete, Mese, and Hypate, which are assigned as the names of the three chords of the ancient musical instrument, the lyre. Alternatively, later they were called Cephisso, Apollonis, and Borysthenis, names which characterize them as daughters of Apollo. In a later tradition, a set of four Muses were recognized: Thelxinoë, Aoide, Archē, and Melete, said to be daughters of Zeus and Plusia or of Ouranos. One of the people frequently associated with the Muses was Pierus. By some he was called the father (by a Pimpleian nymph, called Antiope by Cicero) of a total of seven Muses, called Neilṓ (Νειλώ), Tritṓnē (Τριτώνη), Asōpṓ (Ἀσωπώ), Heptápora (Ἑπτάπορα), Achelōís, Tipoplṓ (Τιποπλώ), and Rhodía (Ῥοδία). According to Hesiod's Theogony (seventh century BC), they were daughters of Zeus, king of the gods, and Mnemosyne, Titan goddess of memory. For Alcman and Mimnermus, they were even more primordial, springing from the early deities Ouranos and Gaia. Gaia is Mother Earth, an early mother goddess who was worshipped at Delphi from prehistoric times, long before the site was rededicated to Apollo, possibly indicating a transfer to association with him after that time. Sometimes the Muses are referred to as water nymphs, associated with the springs of Helicon and with Pieris. It was said that the winged horse Pegasus touched his hooves to the ground on Helicon, causing four sacred springs to burst forth, from which the Muses, also known as pegasides, were born. Athena later tamed the horse and presented him to the Muses (compare the Roman inspiring nymphs of springs, the Camenae, the Völva of Norse Mythology and also the apsaras in the mythology of classical India). Classical writers set Apollo as their leader, Apollon Mousagetēs ("Apollo Muse-leader"). In one myth, the Muses judged a contest between Apollo and Marsyas. They also gathered the pieces of the dead body of Orpheus, son of Calliope, and buried them in Leivithra. In a later myth, Thamyris challenged them to a singing contest. They won and punished Thamyris by blinding him and robbing him of his singing ability. According to a myth from Ovid's Metamorphoses—alluding to the connection of Pieria with the Muses—Pierus, king of Macedon, had nine daughters he named after the nine Muses, believing that their skills were a great match to the Muses. He thus challenged the Muses to a match, resulting in his daughters, the Pierides, being turned into chattering magpies for their presumption. Pausanias records a tradition of two generations of Muses; the first are the daughters of Ouranos and Gaia, the second of Zeus and Mnemosyne. 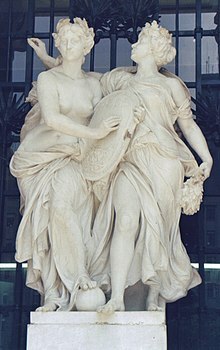 Another, rarer genealogy is that they are daughters of Harmonia (the daughter of Aphrodite and Ares), which contradicts the myth in which they were dancing at the wedding of Harmonia and Cadmus. Calliope had Ialemus and Orpheus with Apollo. But according to a variation, the father of Orpheus was actually Oeagrus, but Apollo adopted the boy and taught him the skill of lyre. Calliope trained him in singing. Linus was said to have been the son of Apollo and one of the Muses, either Calliope or Terpsichore or Urania. Rhesus was the son of Strymon and Calliope or Eutrepe. The sirens were the children of Achelous and Melpomene or Terpsichore. Kleopheme was the daughter of Erato and Malos. Hyacinthus was the son Clio, according to an unpopular account. Hymenaeus was assigned as Apollo's son by one of the muses, either Calliope, or Clio, or Terpsichore, or Urania. Corybantes were the children of Thalia and Apollo. "Helikon, not far distant from Parnassos, rivals it both in height and in circuit; for both are rocky and covered with snow, and their circuit comprises no large extent of territory. Here are the temple of the Mousai and Hippukrene and the cave of the Nymphai called the Leibethrides; and from this fact one might infer that those who consecrated Helikon to the Mousai were Thrakians, the same who dedicated Pieris and Leibethron and Pimpleia [in Pieria] to the same goddesses. The Thrakians used to be called Pieres, but, now that they have disappeared, the Makedonians hold these places." 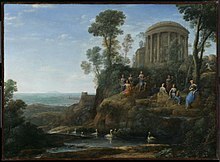 The cult of the Muses was also commonly connected to that of Apollo. 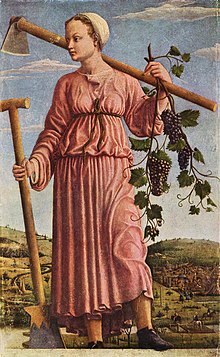 Polyhymnia, the Muse of sacred poetry, sacred hymn and eloquence as well as agriculture and pantomime. Some Greek writers give the names of the nine Muses as Kallichore, Helike, Eunike, Thelxinoë, Terpsichore, Euterpe, Eukelade, Dia, and Enope. In Renaissance and Neoclassical art, the dissemination of emblem books such as Cesare Ripa's Iconologia (1593 and many further editions) helped standardize the depiction of the Muses in sculpture and painting, so they could be distinguished by certain props. These props, or emblems, became readily identifiable by the viewer, enabling one immediately to recognize the Muse and the art with which she had become associated. Here again, Calliope (epic poetry) carries a writing tablet; Clio (history) carries a scroll and books; Euterpe (song and elegiac poetry) carries a flute, the aulos; Erato (lyric poetry) is often seen with a lyre and a crown of roses; Melpomene (tragedy) is often seen with a tragic mask; Polyhymnia (sacred poetry) is often seen with a pensive expression; Terpsichore (choral dance and song) is often seen dancing and carrying a lyre; Thalia (comedy) is often seen with a comic mask; and Urania (astronomy) carries a pair of compasses and the celestial globe. Greek mousa is a common noun as well as a type of goddess: it literally means "art" or "poetry". According to Pindar, to "carry a mousa" is "to excel in the arts". The word derives from the Indo-European root men-, which is also the source of Greek Mnemosyne and mania, English "mind", "mental" and "monitor", Sanskrit mantra and Avestan Mazda. 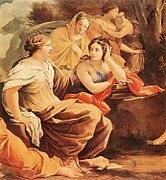 The Muses, therefore, were both the embodiments and sponsors of performed metrical speech: mousike (whence the English term "music") was just "one of the arts of the Muses". Others included Science, Geography, Mathematics, Philosophy, and especially Art, Drama, and inspiration. In the archaic period, before the widespread availability of books (scrolls), this included nearly all of learning. The first Greek book on astronomy, by Thales, took the form of dactylic hexameters, as did many works of pre-Socratic philosophy. Both Plato and the Pythagoreans explicitly included philosophy as a sub-species of mousike. The Histories of Herodotus, whose primary medium of delivery was public recitation, were divided by Alexandrian editors into nine books, named after the nine Muses. 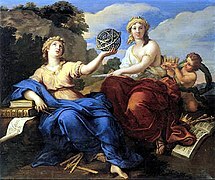 For poet and "law-giver" Solon, the Muses were "the key to the good life"; since they brought both prosperity and friendship. Solon sought to perpetuate his political reforms by establishing recitations of his poetry—complete with invocations to his practical-minded Muses—by Athenian boys at festivals each year. He believed that the Muses would help inspire people to do their best. Ancient authors and their imitators invoke Muses when writing poetry, hymns or epic history. The invocation occurs near the beginning of their work. It asks for help or inspiration from the Muses, or simply invites the Muse to sing directly through the author. driven time and again off course, once he had plundered the hallowed heights of Troy. Besides Homer and Virgil, other famous works that included an invocation of the Muse are the first of the carmina by Catullus, Ovid's Metamorphoses and Amores, Dante's Inferno (Canto II), Chaucer's Troilus and Criseyde (Book II), Shakespeare's Henry V (Act 1, Prologue), his 38th sonnet, and Milton's Paradise Lost (openings of Books 1 and 7). 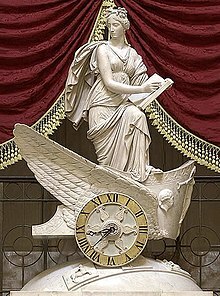 The Car of History, a chariot clock by Carlo Franzoni, 1819, depicting Clio. When Pythagoras arrived at Croton, his first advice to the Crotoniates was to build a shrine to the Muses at the center of the city, to promote civic harmony and learning. Local cults of the Muses often became associated with springs or with fountains. The Muses themselves were sometimes called Aganippids because of their association with a fountain called Aganippe. Other fountains, Hippocrene and Pirene, were also important locations associated with the Muses. Some sources occasionally referred to the Muses as "Corycides" (or "Corycian nymphs") after a cave on Mount Parnassos, called the Corycian Cave. Pausanias referred to the Muses by the surnames "Ardalides" or "Ardaliotides", because of a sanctuary to them at Troezen said to have been built by the mythical Ardalus. The Muses were venerated especially in Boeotia, in the Valley of the Muses near Helicon, and in Delphi and the Parnassus, where Apollo became known as Mousagetes ("Muse-leader") after the sites were rededicated to his cult. Often Muse-worship was associated with the hero-cults of poets: the tombs of Archilochus on Thasos and of Hesiod and Thamyris in Boeotia all played host to festivals in which poetic recitations accompanied sacrifices to the Muses. The Library of Alexandria and its circle of scholars formed around a mousaion (i.e., "museum" or shrine of the Muses) close to the tomb of Alexander the Great. Many Enlightenment figures sought to re-establish a "Cult of the Muses" in the 18th century. A famous Masonic lodge in pre-Revolutionary Paris was called Les Neuf Soeurs ("The Nine Sisters", that is, the Nine Muses); Voltaire, Benjamin Franklin, Danton, and other influential Enlightenment figures attended it. As a side-effect of this movement the word "museum" (originally, "cult place of the Muses") came to refer to a place for the public display of knowledge. The Muses are explicitly used in modern English to refer to an artistic inspiration, as when one cites one's own artistic muse, and also implicit in words and phrases such as "amuse", "museum" (Latinised from mouseion—a place where the Muses were worshipped), "music", and "musing upon". In current literature, the influential role that the Muse plays has been extended to the political sphere. In New Orleans, Louisiana, there are streets named for all nine Muses. It is commonly held that the local pronunciation of the names has been colorfully anglicized in an unusual manner by the "Yat" dialect. The pronunciations are actually in line with the French, Spanish and Creole roots of the city. ^ "muse". The Merriam-Webster Online Dictionary. Retrieved February 15, 2009. ^ From which mind and mental are also derived; see Oxford English Dictionary. ^ * A. B. Cook (1914), Zeus: A Study in Ancient Religion, Vol. I, p. 104, Cambridge University Press. ^ R. S. P. Beekes, Etymological Dictionary of Greek, Brill, 2009, p. 772. ^ H. Munro Chadwick, Nora K. Chadwick (2010). "The Growth of Literature". Cambridge University Press. ISBN 9781108016155. ^ At least, this was reported to Pausanias in the second century AD. Cfr. Karl Kerényi: The Gods of the Greeks, Thames & Hudson, London 1951, p. 104 and note 284. ^ See also the Italian article on this writer. ^ Diodorus, Plutarch and Pausanias are all noted by Susan Scheinberg, in reporting other Hellenic maiden triads, in "The Bee Maidens of the Homeric Hymn to Hermes", Harvard Studies in Classical Philology, 83 (1979:1–28), p. 2. ^ Pausanias, Description of Greece 9.29.1. ^ Smith, William; Dictionary of Greek and Roman Biography and Mythology, London (1873). "Musae" . ^ "Elysium Gates - Historical Pegasus". ^ Ovid, Heroides 15.27: "the daughters of Pegasus" in the English translation; Propertius, Poems 3.1.19: "Pegasid Muses" in the English translation. ^ For example, Plato, Laws 653d. ^ Ovid, Metamorphoses 5.677–78: "Now their previous eloquence also remained in the birds, as well as their strident chattering and their great zeal for speaking." See also Antoninus Liberalis 9. ^ Calvert Watkins, ed., The American Heritage Dictionary of Indo-European Roots, 3d ed., p. 56. ^ OED derives "amuse" from French a- ("from") and muser, "to stare stupidly or distractedly". ^ Sorkin, Adam J. (1989) Politics and the Muse. Studies in the Politics of Recent American Literature. Bowling Green State University Popular Press, Bowling Green OH. ^ NOLA.com. "How to pronounce New Orleans Muses Streets" – via YouTube. Wikisource has the text of The New Student's Reference Work article "Muses". Look up Muse#English or Muse in Wiktionary, the free dictionary. Wikimedia Commons has media related to Muses.